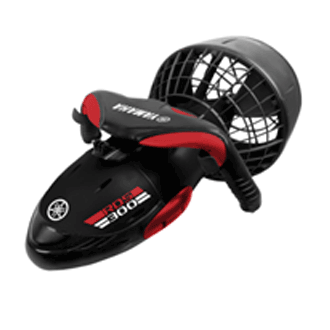 The Sea-Doo Seascooter GTI water scooter is like the ones you rent while on vacation at the beach or lake. 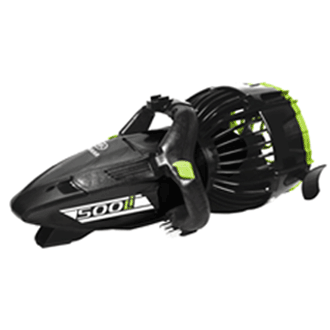 A big performer in a tiny package, the Seascooter™ GTI delivers thrust for a speed of up to 2.5mph/4km/h, down to 100ft./30m depth. It is light enough to carry in one hand making beach diving with a DPV a reality and snorkeling a dream. 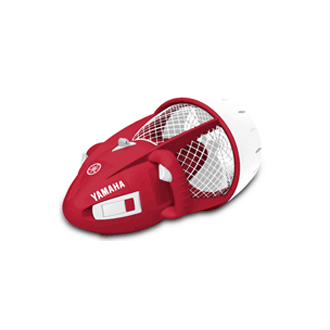 With features like waterproof circuitry, automatic cut off when it is released or encounters an obstruction, plus protective safety grille, it is a great snorkeling buddy. 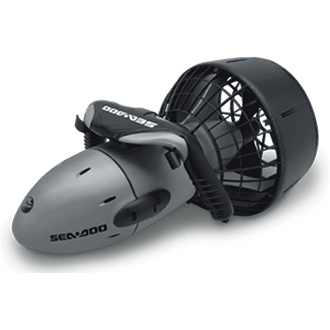 The Sea-Doo sea scooter GTI has been developed for the serious snorkeler, as it has a much more durable feel, more thrust and is rated to 100ft./30m, yet has been tested at 115ft./35m with no problems. The SeaDoo water scooter GTI is compact and easy to carry. It includes a heavy duty nylon duffle bag, battery and charger for a complete ready to us package. This was the perfect companion on my last trip to the Bahamas. 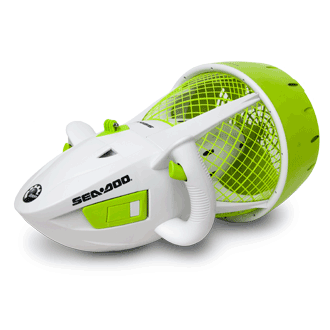 My kids and myself used two of these mainly in the pool, but was a fun addition to bring along our snorkeling adventures. We got lots of strange looks at the airport, but it was fun explaining what it was to TSA. I bought this for my 10 year old son for Christmas, and he spends hours using it in our pool. It is a great performer and so far it has been trouble free and the battery seems to last for more than a couple of hours, but I just ordered a back up for spring break. Wow, what a powerhouse. I weigh over 200lbs and this thing is the perfect DPV for the pool and I use it for snorkeling. It pulls me quickly to my favorite reef and back with power to spare. I recommend this for anyone that is looking for a quality scooter at a great price.